When I play Batman: Arkham Asylum for my PS3, I can basically use my controller as a conduit to embody the caped crusader. I can take control of my favorite childhood superhero and guide him through a world of mystery and intrigue and a plot that surpasses even the craziest comic book adventures. It's fun and exciting, because I get an (admittedly very removed) sense of what it's like to occupy the skin of The Bat from the comfort of my own living room. I find that if you really get into the spirit of these games, it becomes a form of virtual reality. I'm not completely sold on the game's ability to imitate what it feels like to actually play in a major league game; at least not in the same way that Arkham Asylum actually - in a sick, twisted, nerdy way - makes you feel like Batman while he beats the tar out of Joker's thugs. Maybe I just haven't logged enough hours to get the hang of it, but so far The Show lacks a certain "organic" quality of the gameplay that lets you really lose yourself in the world of playing the game - that certain way of controlling your players and making team decisions that goes beyond hand-eye coordination and starts to become instinct. 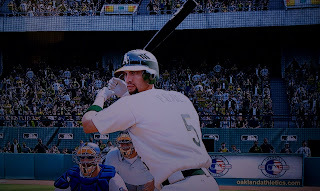 Each baseball video game has a certain flow to it. During the actual baseball game part of it, the controls for batting, pitching, and fielding all contribute to the overall feel, but there's a certain rhythm that develops between innings, between plays, even between pitches. The game shouldn't feel nearly as long as a real major league broadcast on TV (most of which push three hours on average), but rather it should keep the general feel of what the play action looks like, while going at such a pace as to complete a game in 30-45 minutes. TV's one-hour drama format has left our attention spans in utter shambles after all. The Show, however, seems to put more emphasis on the inter-play filler animations and explanatory flourishes by the play-by-play crew than it does on the actual gameplay mechanics. The animations of the players themselves are jerky and imprecise, pitch types are impossible to recognize, you can't pick up the ball off the bat, and the camera controls are utterly counterintuitive. I'm willing to put in my hours toiling in the minor leagues until I get it right, but I'm not sure if the problems with the game engine are problems that time and practice can solve. 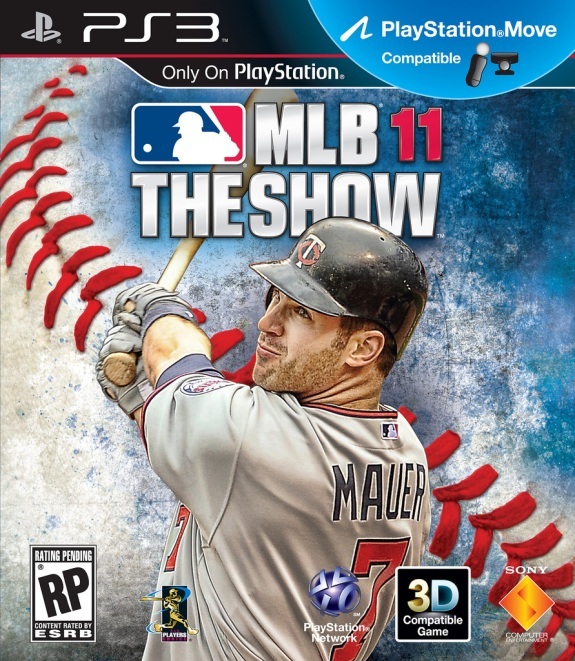 I've played plenty of iterations of the MLB series, some before "The Show" moniker was added, and the learning curve for all of them has been pretty steep and unpredictable. 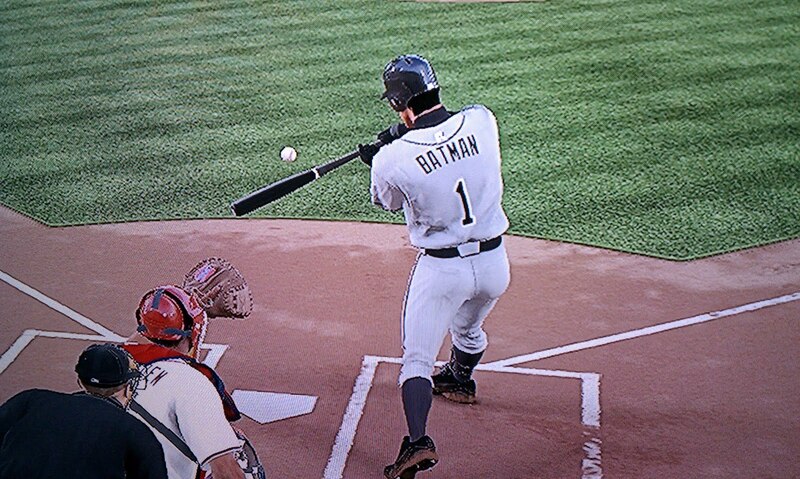 Hunter S. Batman takes his cuts in the minors! As far as the "story mode" of sorts, where you create a player and follow him from AA all the way to the show itself. Well, presumably it goes all the way to the big leagues. At this writing, I haven't yet clawed my way out of the Southern League. But that's all part of the "tutorial" nature of the first levels of games these days. I mean, even in real baseball there's a level of the minors called the Instructional League. I'm about as experienced at playing the game as my digital avatar - Hunter S. Batman - is at major league action, so it makes sense that I should start at the bottom. The idea of leveling up your character by performing well in certain situations is more engaging than taking control of an entire simulated lineup of a major league team. But it can be frustrating, because you live or die with the successes and failures of your created character. And when you're placed in a simulation where it's hard to really see what's going on or control your players, it can sometimes be hard for your little created character to do well. The Rosters: Up To Date! It's nice to be able to play a baseball game where the virtual dudes I control on the screen share the same general level of skill with the real players they represent. But who would want to play a simulated game with players on the real-life major league teams? You might as well watch them on TV and it would actually look natural and mean something in the standings! No, the reason it's nice to have up-to-date rosters is so you can dismantle them and create your own fantasy baseball world. But the roster management system is so confusing! It's easy to trade a player from one team to another, or alter the lineups and pitching rotations, but trying to move people between your MLB, AAA, and AA rosters requires more screen toggling than I'm comfortable with. The player sorting system is also strangely put together and not at all helpful. Player evaluation is done not by numbered scores, but by unmarked meters stuck at various vague positions on a line. The game definitely goes more by the scout's "gut feeling" system rather than the sabermetric "rational evaluation" system. But once you have those rosters put together, that's where the fun begins. While The Show has proved an inadequate simulation for playing in a major league baseball game, it provides a pretty decent simulation of managing a major league roster. Which means you can play out a reasonably decent simulation of what your ultimate fantasy team might look like and play like - over a game, over an entire season, or over the near future of the franchise. For example, what would happen if the Oakland A's, a famously small-market team (see Moneyball), were able to sign Albert Pujols, arguably the best active baseball player, when he becomes a free agent next year? What would that mean for the lineup, the budget, the overall balance of the league. MLB 11 The Show can tell me, but not only that... it can show me! I made such a simulation where all the best off-season acquisitions from each league played against each other. Part of it looked pretty realistic, but you have to sit there and actively skip through the interminable practice swings and multiple replays of even the most routine plays. I have a lot of rosters on my plate to develop and simulate (including a representation of the fantasy team I drafted this year [currently in first place, I might add! 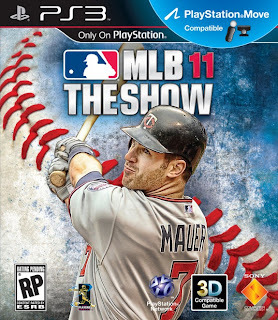 ]), so I feel like I will stomach the imperfections within the system and use MLB 11 The Show to live out my wildest baseball fantasies for months to come!